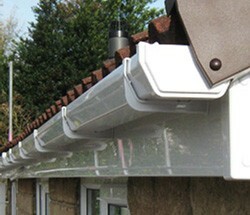 Fascias, soffits and barge boards are important parts in your home's roofline. They keep the roof watertight when they work, but even well fitted parts are prone to wear over time. It's best to deal with rotten and ill fitting fascias, soffits and barge boards before they become a problem. Our friendly and honest team of roofers cover all of Glasgow, providing excellent quality every time. When you need roofing you want a local firm that you can rely on. How much we care shows in our results, our dedication to the task in hand, and our previous customers' satisfaction. We'll also inspect the eaves felt and rafter ends, ensuring your roof remains in perfect working order. Call your local Glasgow roofers today on 0141 340 9604. Our friendly roofing team will come out to assess the problem and will offer a free quote so you know what to expect. We're there whenever you need us for fascias, soffits and barge boards.